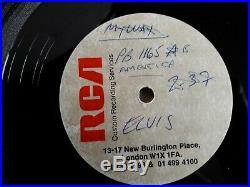 Unique Acetate of My Way, Live, by Elvis Presley backed with a live version of America. My Way has PB 1165 B and a time of 2-17 on one side of the label while America has PB1165A with a time of 2.37. My Way is graded as VG + and plays excellent, no skips, no jumps with only a few crackles. America has some crackles and a very brief pop half way through, but again, this is hardly noticeable but would grade this as VG. 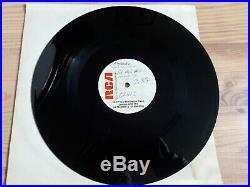 I have never seen one of these for sale before, and I think two sided acetates are not as common as single sided ones. Coupled with the fact that these are live versions, I think it is fairly unique. I have played both sides through twice but as it is an Acetate, I will not be playing either side again. Unfortunately, I have no idea which concerts both tracks are taken from. 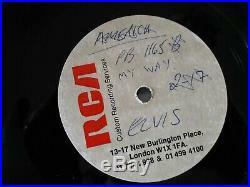 The item "ELVIS PRESLEY ACETATE MY WAY LIVE VERSION ON RCA- RARE" is in sale since Monday, April 1, 2019. This item is in the category "Music\Records". The seller is "shanoneil-1" and is located in Roscrea. This item can be shipped worldwide.